Dr. Schorr received his undergraduate degree at the University of Texas in Austin, Texas and his medical degree from the University of Texas Medical Branch in Galveston, Texas. Upon completion of his internship and residency at Emory University Hospital in Atlanta, Georgia, Dr. Schorr obtained his specialty training at the Medical University of South Carolina in Charleston. While at MUSC, he received an additional year of training in advanced therapeutic endoscopy. 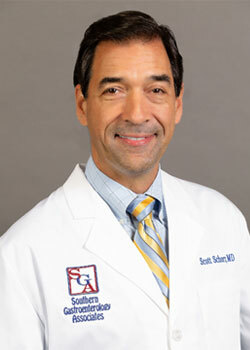 Dr Schorr is board-certified in both Internal Medicine and Gastroenterology. His is a member of the American Medical Association, the American College of Gastroenterology, the Georgia Medical Association, The Gwinnett-Forsyth Medical Society and the American Society for Gastrointestinal Endoscopy.